Lock in a great price for Holiday Inn London Watford Junction – rated 9 by recent guests! The bed was the most comfortable across my whole trip. Great location to town center by foot and central London by rail or car. Private parking was a plus. Pleasant staff. Nice restaurant area and outdoor patio. Room was clean and tidy. 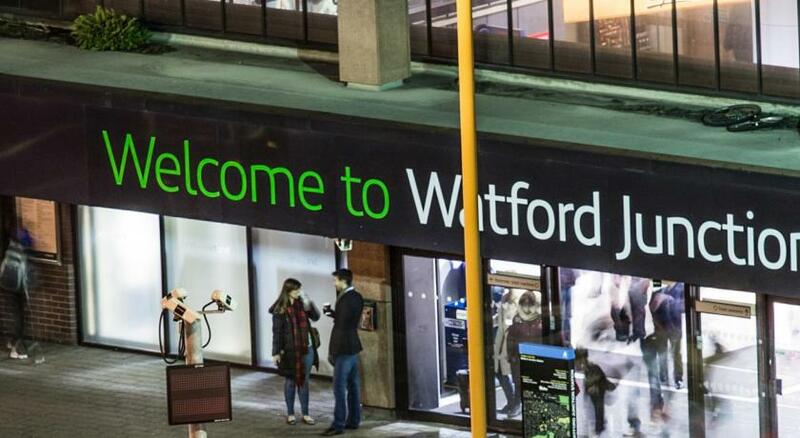 Good location to Watford high street and the train station. Breakfast was good. Comfortable and good value. Staff were very helpful. hotel was nice, clean as you would expect, staff were very nice relaxed and easy to talk to ask questions. food- I only had breakfast but there was enough for 2 courses, the cooked breakfast was very tasty. as someone else had put on another review. if you want a quiet night, 1 close the window if at the front of the hotel or 2, request a rear room. as road/traffic noise. Good breakfast and facilities. Nice lobby experience. Great location with taxis lined up just in front and few metres to the junction. I found this hotel exceptionally good with regards to the price and location. The staff were attentive, but not over-powering, the room was clean and very spacious. Breakfast was excellent and I enjoyed a relaxed drink in the bar in the evening. It was great you could get drinks and snacks to take away . The breakfast was very good quality considering it is a simple buffet-style and there were lots of options, including pancakes which my partner enjoyed. The beds were really comfy, and the staff were very polite and helpful! Would recommend, especially if you're visiting HP Studios. Holiday Inn London Watford Junction This rating is a reflection of how the property compares to the industry standard when it comes to price, facilities and services available. It's based on a self-evaluation by the property. Use this rating to help choose your stay! One of our top picks in Watford.Holiday Inn London Watford Junction has a central location just 2 minutes’ walk from Watford Junction Railway Station and 10 minute's walk from the town center. The hotel features a restaurant and a bar. Each room at this Holiday Inn has bright, modern décor and includes a flat-screen TV and air conditioning. Free WiFi is available throughout the property. The café and stylish lounge area serves Starbuck’s coffee. There is a limited fitness center on site as well as a business center with meeting spaces. Watford Junction Station connects you to London Euston in just 25 minutes. Luton Airport is a 25-minute drive from the hotel, while Heathrow can be reached in around half an hour by car. This property also has one of the top-rated locations in Watford! Guests are happier about it compared to other properties in the area. This property is also rated for the best value in Watford! Guests are getting more for their money when compared to other properties in this city. When would you like to stay at Holiday Inn London Watford Junction? This room has bright, modern décor and includes a flat-screen TV and air conditioning. Free WiFI is available in the hotel’s public areas. Public parking is available on site (reservation is not needed) and costs GBP 6 per day. Not your typical branded experience, so you have to try it for yourself! House Rules Holiday Inn London Watford Junction takes special requests – add in the next step! Holiday Inn London Watford Junction accepts these cards and reserves the right to temporarily hold an amount prior to arrival. Great location, clean modern and very good value for money. Clean warm and modern, excellent breakfast and very friendly staff! Walking distance to all local bars/ restaurants and a good base for visiting Harry Potter studios! As the main road was right outside, we could hear the traffic. It didn’t disturb us so we were cool with it. Perfect location as we went to the Warner Bros Harry Potter studio tour but also wanted a quick travel into central London afterward. The proximity to the station is brilliant. The hotel was clean, tidy and really modern, furnished fabulously. The rust that dripped onto & stained the paintwork of my car from the covered section of the rear car park. The reception staff were first-class. In particular Abir. Professional, pleasant, super-helpful. The bed wasn’t very comfortable. New mattress needed. The room was a good size. Nice big shower. Quiet. Very efficient, professional, friendly staff. The standard of the hotel was much better than I expected. Overall look of the room, comfortable bed, huge mirrors.